Day one has come and gone. I think we must have walked close to 10 miles in all, but it was worth it and then some. Aside from all of the great panels, excellent exhibits and console rooms (my personal fav), we got to meet a ton of cool people. Like these guys. 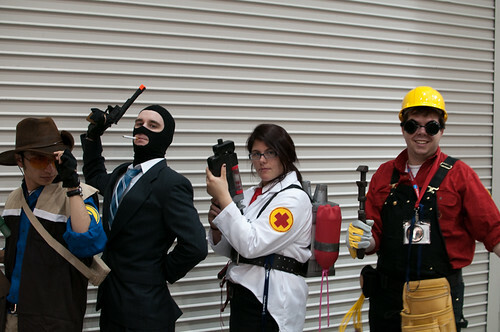 Not only were the costumes spot on and the poses tight, they seemed to be in character…the entire time. We also got to chat with the people at Bonus-Level.com about their podcast, which is totally excellent. Be sure to check it out. I personally had a fanboy moment when I got to meet both Jonathan Coulton and Storm of Paul & Storm. They were both very friendly and funny, taking time to talk with me before moving on to the next signing. Storm even signed our swag. To all of you that we got to talk with, we hope you like the music and continue to come back for more. We’ve got several more tunes in the works, so check back often! 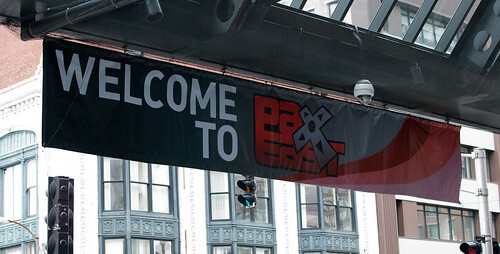 Hope to see you all at PAX next year!